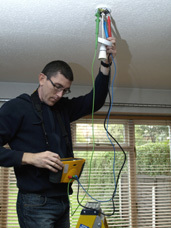 Electrical installation work should only be carried out by someone who is competent. It's easy to make an electrical circuit work - it's far harder to make the circuit work safely. "After several failed attempts from other electricians to fix our security lights at the back of the house we asked Dave to take a look. After an initial survey, he promptly recommended a solution, quoted a price and fixed a date. Despite the freezing temperatures and icy paths, Dave installed and tested our new lights on the day agreed: taking the opportunity to repair our kitchen lights as well. The standard of workmanship throughout has been outstanding and I would gladly recommend him." What is a Period Inspection Report - and why should I get one? Like so many things that we use on a daily basis, the electrics in our homes inevitably deteriorate with use and age. Because of this, it is important to regularly check them in order to be sure that you and your family are not put at risk, and that the installation continues to be in a safe and serviceable condition. In order to ensure that your electrics are safe it may be time to get a PIR (Periodic Inspection Report). When is a periodic inspection report needed? It is recommended that periodic inspection and testing is carried out at least every 10 years for a domestic installation. You will almost certainly require a recent PIR if you are buying or selling a house. The Periodic Inspection Report is a valuable record of the condition of the electrical installation. 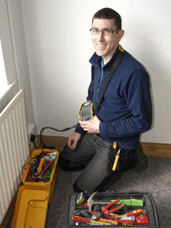 Periodic inspections should always be carried out by a competent electrician. If the report recommends improvements to the installation, ask for a fixed price quotation for the remedial work from at least three electrical contractors. The improvements do not necessarily have to be carried out by the electrician who provided the Periodic Inspection Report. The Electrical Safety Council is an independent non-profit-making organisation, registered as a charity, set up to protect the safety of consumers. Supported by all sectors of the electrical industry as well as local and central government, the ECS deals with all electrical safety matters on behalf of consumers. The ESC are a driving force in the field of electrical safety for the protection of consumers, working with other organisations to improve standards and promote best practice. The thought of having electrical work carried out in your home can be daunting, especially if you have to put your trust in an electrician you have never used before. Since July 2008 virtually all new or altered circuits in homes must have RCD protection. For friendly advice and a free quotation call me on 07790 752 120 or 0113 256 0138.